This weekend was the first time I’ve flown since I’ve gone gluten free. To be honest, I had such a busy week, I didn’t think much of it till the day before my trip, at which point I thought, Huh. Wonder what I’m going to eat this weekend? I was headed out for a day-trip to Texas to see one of our Revolve Tour events for teen girls and spend some time with a couple of authors/speakers/friends I dearly enjoy. I left my house around 4:45 Saturday morning (groan) and probably wouldn’t have eaten anything if I hadn’t still been on medicine for my allergies and congestion. I grabbed a piece of GF toast on my way out the door. 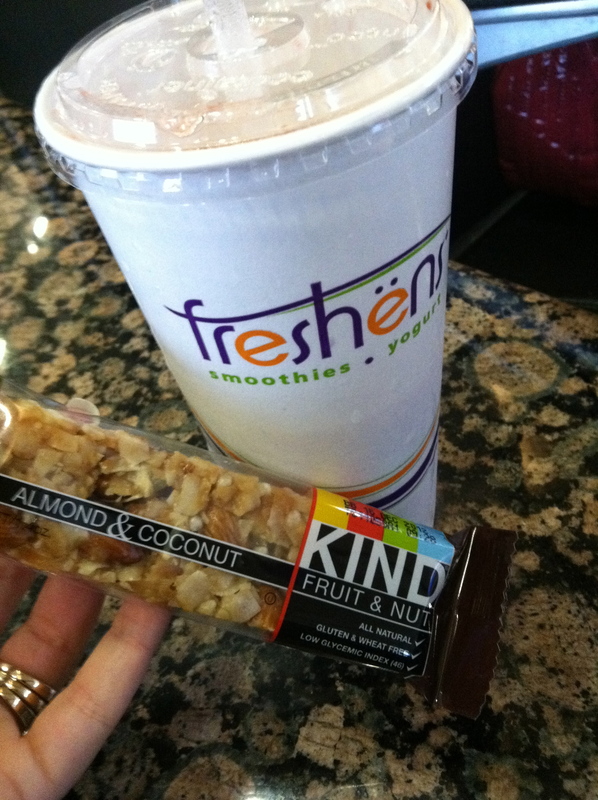 Other than some juice on the flight, I didn’t have anything else till I got to Dallas and was delighted to find a smoothie shop complete with Kind Bars. I got a regular strawberry-kiwi green tea smoothie, which served as my breakfast and coffee all in one. Spending more than $8 for this and the bar made me gulp till I reminded myself I was at the airport. I probably would have spent about that on any breakfast that included food and a beverage. And the Kind Bar? Delicious! The coconut almond was awesome! The rest of my day was up in the air. I didn’t bring snacks with me because I wasn’t checking bags on this 32-hour trip, and I didn’t have time to stop anywhere. Once I got to my final destination in Austin, I had to get my rental and book it to the hotel to be picked up by the shuttle and taken to the conference; I walked in right before it started. The rest of the day, I was at the mercy of the catering brought in for the staff and/or what was at the venue. Lunch included pre-packaged subs and cookies, but the subs were big enough that eating the turkey, lettuce tomato, and cheese was actually enough to hold me over for awhile. For dinner, I was pleasantly surprised by baked chicken with spinach and tomatoes (and a sauce that may not have been safe for someone who actually has celiac but was surprisingly good) and salad. Can I tell you I ate four pieces of chicken? Not full-size chicken breasts or anything, but still. 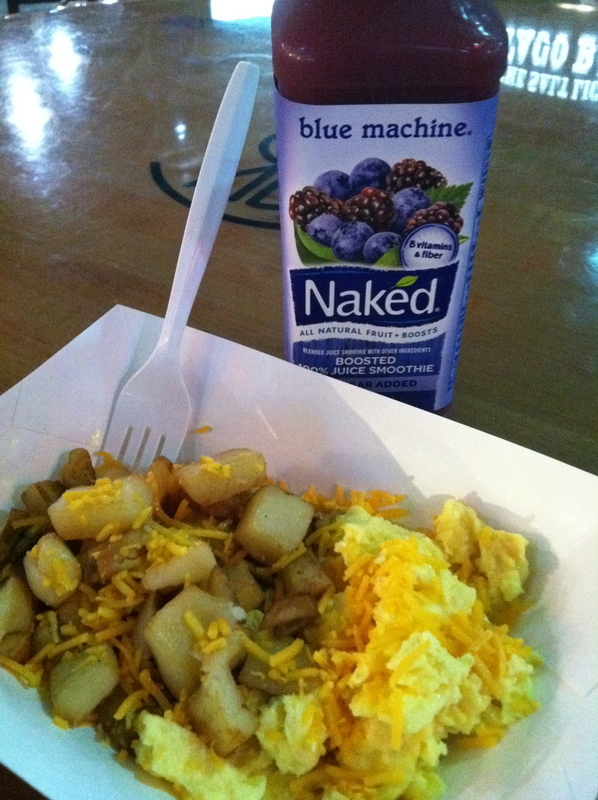 This morning I left my hotel at 5:30 (again, groan) and grabbed a shell-less breakfast taco at the airport and a Naked smoothie. 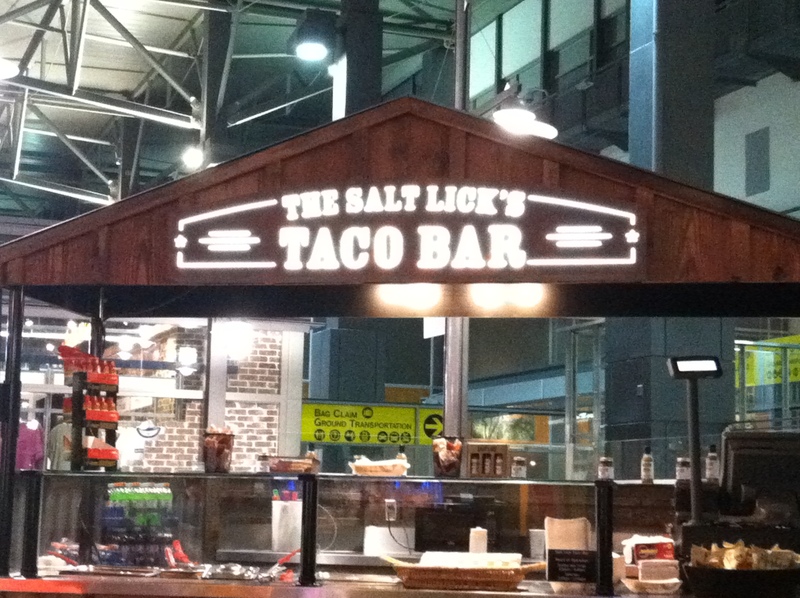 Apparently, breakfast in Texas only comes in tacos. It, too, was actually pretty good. Eggs, potatoes, and cheese. When I got back to Dallas, I got another Kind Bar because it was just so good yesterday. Overall, I think I had more options this weekend than I do when we drive through Kentucky on our way home to Ohio. No offense, Kentucky. And now for my shameless plug; if you have daughters or friends who are teen and tween girls, please check out the Revolve Tour. This was my third event, and I think my most favorite yet. They used to be two days in big arenas, but now they are one-day events in smaller, more intimate venues, and I loved it. The music, the speaking, the beautiful church, time catching up and chatting with people I don’t see terribly often—it was all a much-needed day away from regular life for me. My friends Chad Eastham and Jenna Lucado Bishop and the rest of the team have some really powerful messages—messages that I needed to hear as an adult—plus it’s a really fun day. Just stash some Kind or other GF bars in your purse.